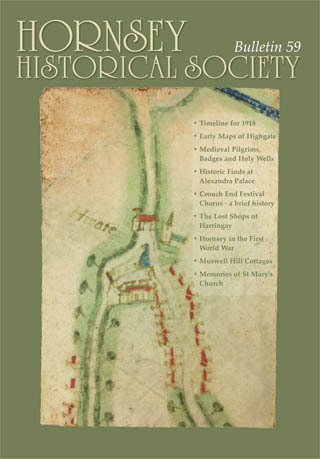 Hornsey Historical Society Bulletin 59 contains articles with a wide chronological range, covering aspects of the history of our part of London from the Middle Ages to the present day. In ‘Medieval Pilgrims, Badges and Holy Wells’, our Chairman, Keith Fawkes, gives an overview of pilgrimage in Medieval England, which narrows down to an account of pilgrim sites in London with particular attention to those in North London, especially Muswell Hill. This was also the subject of an HHS public talk which Keith gave on 8 May 2018. Peter Barber, our President, in ‘Early Maps of Highgate’ explores maps of Highgate dating from 1608 to 1688, including the earliest known relatively detailed one, of 1608, hitherto unpublished. The maps illustrate both the selective attitude towards map-making in this period and the increasingly detailed depiction of Highgate village, providing a lesson in reading maps where geographical accuracy is not a major concern. Iconic local institutions are the subjects of two articles. In ‘Historic Finds at Alexandra Palace’, Kirsten Forrest, Regeneration Manager at Alexandra Palace, describes some fascinating finds made there during recent restoration work being done on the East Wing of the Palace in preparation for the reopening of the Victorian Theatre there. Betty Rosen in ‘Crouch End Festival Chorus – a brief history’ traces the evolution and growth of the Chorus, created and still led by David Temple, from its humble beginnings in the 1980s to the internationally known choir it has now become. Nicholas Allaway completes his series of articles on Hornsey in the First World War, and Janet Owen’s timeline of the war reaches its conclusion in 1918. Following up their article from last year on shops in Quernmore Road with one on Wightman Road, ‘The Lost Shops of Harringay’, by John Hinshelwood and Stephen Rigg, surveys the sobering fortunes of a small group of local shops over a period of 120 years, providing a discomforting account of the social changes that have accompanied the closure of most of them. We also have two shorter pieces. In ‘Muswell Hill Cottages’, David Frith (with Peter Barber) briefly describes a little group of 19th century parish cottages, early social housing, demolished in 1899. In ‘Ann’s Memories of St Mary’s Church’, Ann Jones, a lifelong Hornsey resident, recounts her memories of another demolished building: St Mary’s Church, the former late Victorian parish church where she worshipped as a child, became a bell-ringer, taught in the Sunday School, and was married. It was knocked down in 1969. There are also two book reviews and a short correspondence. The Bulletin is free to all members. If you aren’t a member and would like to join you can find details on the membership page. As well as the Bulletin, members also receive our quarterly newsletters, free entry to all our monthly lectures and advanced invitations to all special events and outings. We welcome contributions to the Bulletin from interested authors, who do not need to be members of the Society. Articles for inclusion should be concerned with Hornsey, its residents and its history. A length of about 2-3000 words is suggested, but shorter pieces such as letters or reviews of books about local history can also be accepted. All articles are read prior to acceptance by members of the Publications Committee, who may suggest revisions. Material should be sent by email attachment in Word format (not PDF) to the Editor, Professor Sandra Clark, who will be happy to deal with any questions about potential contributions. Illustrations are encouraged.